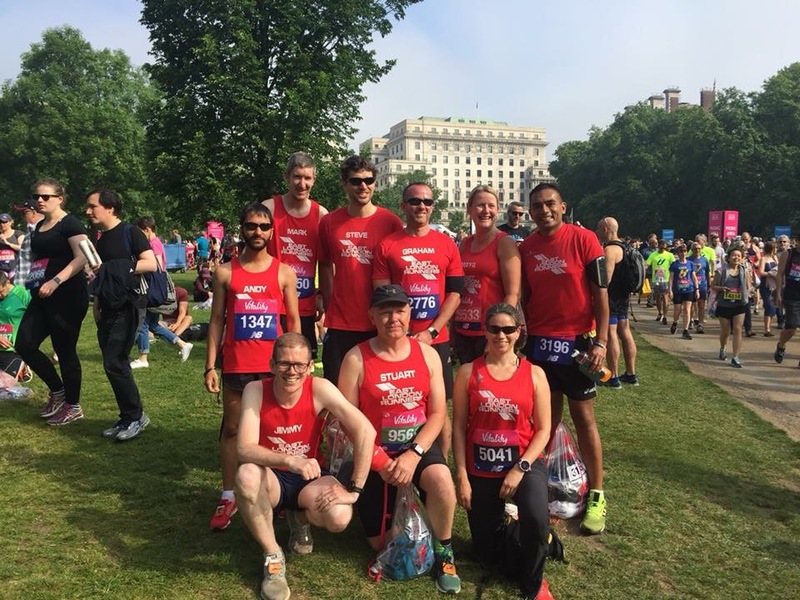 I was slightly apprehensive about running the Vitality London 10,000 this year. I haven’t done any races since Royal Parks last October, and training has been sub-optimal this year, having only run ~560k so far. This is no humble bragging- fellow runners will agree that this is indeed low mileage! I took the 8:12 train from Woodford where I met Stuart Barton, and we picked-up a few other ELR runners en-route. We arrived in Green Park just after 9am, and Jamie Xavier also met us here (in club colours!) for a group photo before we all parted ways as we were in different waves. I also met Ilia here briefly, a fellow Strava friend from Edmonton Running Club. I then made my way over to the entrance of the blue wave and saw Mat Jiggins here, too. After a short 800m warm-up with some strides, I started to relax. At 9:50, I entered the starting pen and around this time the elites joined in (including Mo Farah) and I saw Jay Belham here for a quick pre-race chat. We set off promptly at 10am. I always have a very bad habit of getting excited and going out too fast. Not today. I intentionally slowed down, despite the legs feeling good, and completed the first kilometre in 4:06. Feeling comfortable, I then did the second km in 3:49, but knew this pace was not sustainable so eased back. I knew a PB was off the table (clearly!) so didn’t want to hurt myself for the sake of running a minute or two quicker. I pushed forward, maintaining a good level of effort, and tried to not look at my watch much, concentrating on my breathing and running form. I felt a tap on my shoulder around the 4km mark (I think!) and it was Simon Davies, a friend from Strava. We had a quick chat before he pushed on. I reached 5km in 20:45. 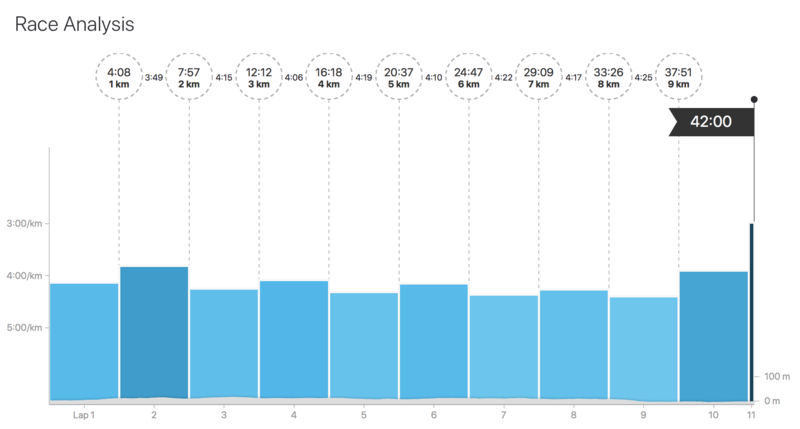 Kilometre splits were typically a little ahead on my Garmin. The next few kilometre splits were slower, and I finally reached the 7km point and a quick glance at my watch showed 29:09. I was at the 8km point at this time in the 2015 race, which made me feel a little sad to be honest. I though I could still get a sub-42 today, though. I continued to push forward and finally reached the 9km point. I kept the pace steady and saw Mark Moir at the 800m to go point. I gave him some encouragement and tried to push harder for the remaining distance, finishing the final kilometre in 3:54. My official finish time was 42:00 exactly. My Garmin showed 10.07km, and I was pretty glad it was over as I really didn’t have much more left in the tank today (well, more mentally than physically). I met Simon again at the finish and we walked over to collect our goodie bags, which contained a NB tech-tee before we had our medals hung over our necks. Thank-you to the lovely volunteers. I then went for a post-race massage and quickly got seen as there were not many runners there yet. Perhaps not many were aware? Anyone who knows me knows I don’t like to be be touched much(!) let alone get rubbed by a stranger. But post-race massages are always welcome as the legs feel amazing after (and they certainly did!). I’ll thank myself on tomorrow’s recovery run, I’m sure. Sania and I then went for some post-race coffee and a snack at Khave in Picadilly Circus. She’s amazing and I’m really thakful for her coming to all my races and taking some great photos and videos of me. We then had a walk around before heading home. « HomePod- The best smart home speaker? Wow! 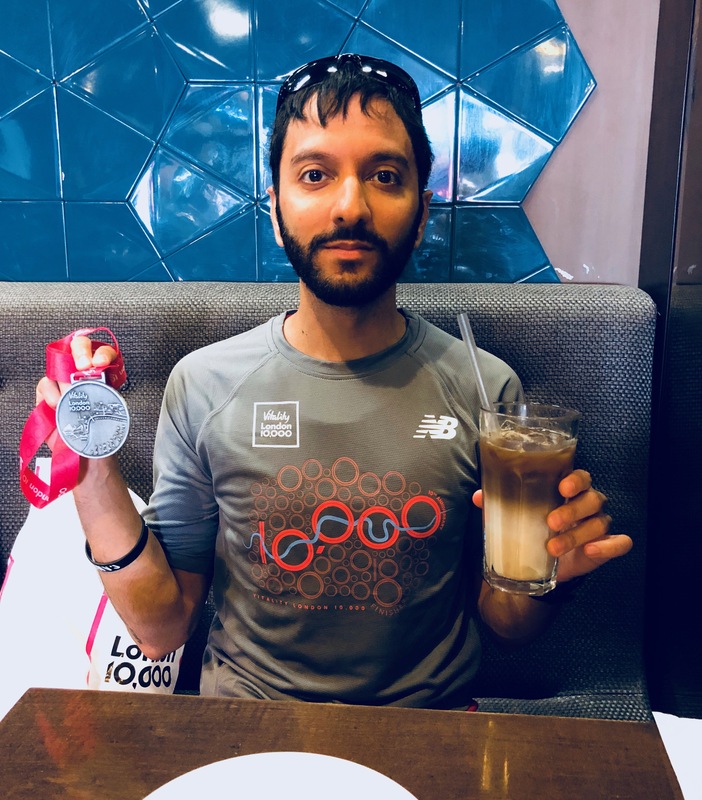 I’m trying to transition from a 5k runner to a 10k runner. I only hope to be as quick as you one day!